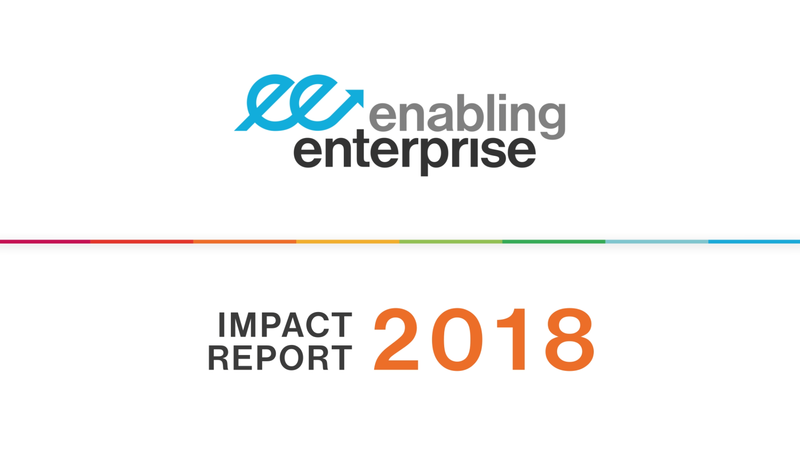 2018 has been a transformational time for Enabling Enterprise. In our ninth year, we’ve had an impact on more students than ever before and expanded the reach of our award-winning approach through launching the cross-sector Skills Builder Partnership. So our starting point is eight essential skills: Listening and Presenting, Problem Solving and Creativity, Staying Positive and Aiming High, and Leadership and Teamwork. These are the skills that underpin success at every stage of life: they unlock learning at school, ensure young people are fully prepared for the independence of university and college, and empower people to land their dream job. In May, we officially launched the Skills Builder Framework, which breaks down each of the eight skills into fifteen teachable and measurable steps. It’s the culmination of half a decade of learning, and benefits from the expertise of over 60 leading organisations and individuals from a range of sectors. Schools and organisations can implement the Framework using the Skills Builder Principles, which lay out the ideal way to explicitly build skills with the same rigour as we build literacy and numeracy. Schools can join the Skills Builder Partnership and get access to Training and Support from our outstanding qualified teachers. We provide a wide range of classroom resources to help learners build essential skills, including posters, certificates and a series of short video-based activities. Our easy-to-use assessment tool helps teaching staff assess students quickly and effectively, and see next steps. Schools can deepen the approach with further Training and Support to integrate essential skills into the curriculum, as well as Classroom Projects that bring skills learning to life across multiple sessions. We also help to run Challenge Days, where larger groups of students can collaborate and build skills on a day-long activity, as well as inspiring Trips to local Employers, which link skills built in class to the working world as students work with volunteers and get a flavour of the industry. We’ve been able to expand this approach to many more schools around the country in 2018, working with 335 schools and more than 4,000 teachers to transform the essential skills of nearly 96,000 learners. We are often making a difference where it is needed most, as over 60% of our schools serve students in the most deprived 40% of communities. Additionally, we have been able to reach a further 4,000 students through our online skills videos and resources available through the Skills Builder Hub. We’re also excited to be making an impact in a number of places beyond the UK, working with schools serving 420 students internationally to build essential skills using the Framework. We’re deeply grateful for the support of our ever-growing network of trip-hosting employer partners, and the vital work of our strategic partners. Together, we can see our work making a real impact. For students who had not taken part in our programmes, we see a growing gap inessential skill proficiency, amounting to almost a whole year of missed progress by age 10. Primary students not working with us do not make the minimum 1 step of progress needed every year to stay on track. This leaves on average 82% of students below or far below their expected essential skills targets. In comparison, students who benefit from our consistent approach stop falling away from their yearly targets, showing on average an extra 3.8 months of progress. This keeps them on track, as they make 1.12 steps of progress and move beyond their target each year. 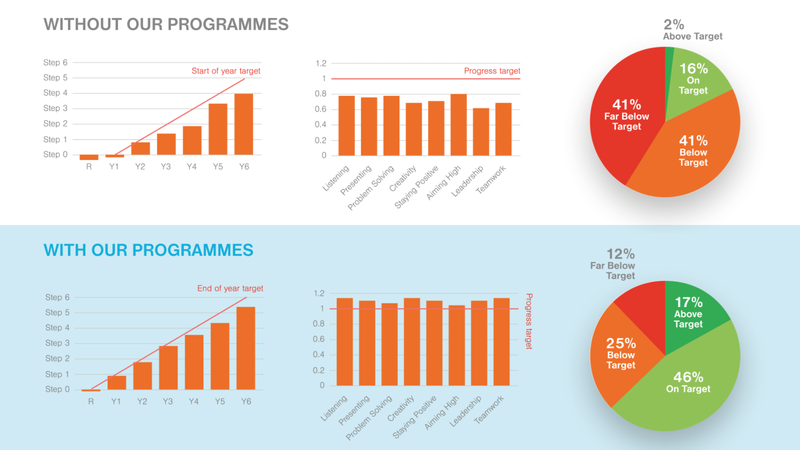 By the end of the year with our programmes, on average 63% of students are above or on target when it comes to the essential skills. We’re keen to continue making the approach as impactful as possible, so with the launch of the Skills Builder Partnership in May we have joined with a host of innovative organisations that build essential skills with children and young people. We believe widespread adoption of the approach, common language and standardised expectations of the Framework will increase the effectiveness of skills education across contexts. In partnership, we have the opportunity to achieve something brilliant for our children and young people: ensuring that they all build the essential skills to thrive.